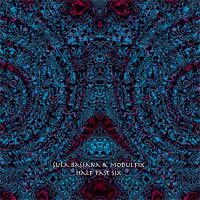 This is a new release on the Sulatron label, with Sula Bassana (Synth, drum box, guitars, drums, flute) hooking up with Modulfix (Synth and sequencer) for a mostly improvised electronic music space out. If you like the Sula Bassana Sulatronics CD, you will probably dig this stuff as well. Elektrance begins with a repetitive synth sequence over which they layer all sorts of spaced out sounds. It is not at all techno music. A little over half way through it gets really spaced out and then picks up again. Schon is next and 9½ minute trip into ambient space with a chill out feeling to start but it evolves into a darker theme as it goes along. The Birds is the longest track at 15 minutes and begins with some recordings of Birds and then the strange synth sounds slowly bubble forth and some beats come in and an almost reggae like synth rhythm begins. The track continues evolve and devolve with the birds still churping away (both real and synthetic!). Von Menschenhand, is a darker track and features a cool guitar line, almost giving the piece an Eastern flavour at times as the synth oscillates back and forth. Real drums kick in and this one develops into a sort of space rock jam but still heavily dominated by the synthesizers. Great track.. The title track, Half Past Six, ends this pretty spacey electronic adventure. If you dig experimental electronic music, then you must check this one out!